Once you have set up your SuperControl account, entered your property information, pricing and any future bookings, you are ready to start taking bookings. Here’s what happens next. There are lots of ways you can display SuperControl on your website. The standard calendar view makes it easy for your guests to see at a glance what’s available and what’s booked. To create a consistent user experience throughout the booking process, we take the design of your website and apply it to your SuperControl booking pages. You can customise your calendar colours to complete the look. Then you add the calendar to your website. Now, when a visitor to your website wants to book, it’s easy. Just a 3-step process and they’re done (bookings are provisional until you confirm them). When you log in to your SuperControl account, you arrive on the payment reminders page. It provides a good overview about what’s happening; you can see any payments that are due or overdue, as well as any new bookings you have (these show in bold until you have clicked on them to view them). When you click on a booking you can see all of the booking details, the payment summary, answers to any questions you added to your booking form, and any notes you make are saved here too. This all helps you personalise the guest’s experience and make them feel really valued. You can take and log payments here, view history and correspondence (including any emails that are scheduled to send automatically); the whole booking can be managed from here. You can still take bookings face-to-face, over the phone or by email. Grid view shows availability at a glance; you can see all of your bookings and they are colour coded to show the booking’s status. It shows provisional bookings, bookings where the guest has part or fully paid, and if the property is closed. To place a booking manually, you simply click on the arrival day and then fill in the booking details. If it’s a returning guest, you can click Lookup past customers and it will fill in these details for you (pulled from previous records saved in your SuperControl database). When you click save it generates the booking, and from here on you manage the booking in exactly the same way you manage one that has been made online. 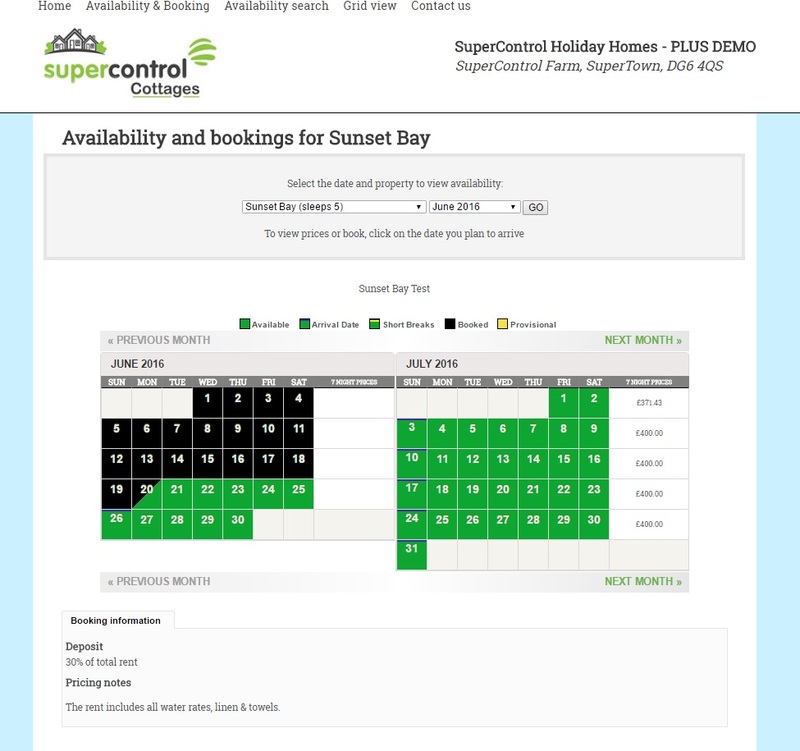 SuperControl has a whole host of clever features to help you boost your bookings and save you time. You can set up emails to send automatically when certain criteria are met, create special offers and discounts, monitor what booking sources work well for you and more. For further information about the marketing, reporting and analysis features in SuperControl, take a look at our Knowledge base.